A letter from Mark Twain. When William H. Hamman, a two-time candidate for Texas governor, was murdered on the streets of New Birmingham in 1890, he left a legacy as an enterprising businessman and investor. 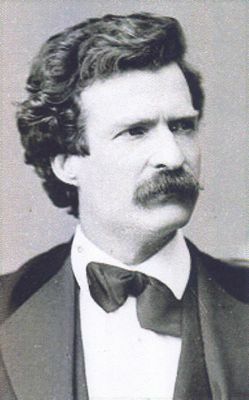 But often overlooked was his friendship with Samuel Clemens. Kevin Stingley of Rusk, an authority on New Birmingham, recently sent me a copy of a letter from Hamman’s papers bearing evidence of the friendship, as well as signs of the marvelous wit that made Sam Clemens famous as Mark Twain. Here is an odd thing. Looking among some checks of a New York bank this morning, I came across a red one--and behold it is that old check I sent you six weeks ago. You returned it. And I immediately sent it back to you, requiring that you take Sam (Bowen’s) judgment upon the question of accepting the check and returning it to me. “I have looked through the stubs of two check books and there is only one that corresponds to this--that is, your name and the amount of $20. It corresponds in all particulars, being check No. 41 of the New Year. Therefore, I never enclosed this check to you at all and you never reminded me of my blunder. That was bad business because it made me judge Sam (Bowen) upon false premises. Or at least, I would have judged him for only a day or two. I was saying to myself, Sam Bowen knows that I don’t want that money from him or anybody else who is cramped. But if he is a true Bowen, he will sell his shirt to pay when the month of his promise is up. A week or two from now, I should have been saying, Well, poor Sam is a wreck, for the family pride is gone out of him. Confound you, Will, why didn’t you tell me I had forgotten to enclose the check? I was once dead broke for several months and sewed up bursted grain sacks on the San Francisco wharves for a starvation living (when I was already sufficiently famous to be welcome in the best society of the city and state) rather than borrow money. I hate to see Sam Bowen show himself to be less a man. But still this check is his, not mine. Therefore it is my imperative duty to forward it instead of tearing it up and keeping shrewdly mum about it. It is for him to say whether it shall be accepted as returned. Therefore, you tender it to him and explain. We don’t know why Sam Clemens (or Mark Twain) sent a check to a man named Sam Bowen, and we don’t know Texan Will Hamman’s role in this little mystery. But we do know that Mark Twain could weave a good story out of anything--even his forgetfulness in sending a check to a friend.